After an unexpectedly late (and rather too much fun) night mid-week at The State Social in Shebeen Chic, we were in need of some severe health intakes come the weekend. I had picked up some lovely beetroot in the Temple Bar Market last Saturday and it needed eating. I’d had Lucas Hollweg’s recipe for Beetroot, Lentil and Feta Salad in my head since it appeared in first Sunday Times magazine of 2010. Beetroot is a funny one. It’s so intrinsically linked – to me at least – to bad school food and brine. Although I enjoyed roasting the beets, peeling away the skins and watching as the Feta was taking on a delightfully pink hue, I’m not sure if I’m terribly into beets. Perhaps too much damage was done by the pickled Chef variety (blurregghgh) in my childhood for me to ever come to terms with the thick texture and somewhat tinny taste of this rooty veg. In saying that, this recipe is a lovely way to take in the rich nutrients that the Beet provides. The Beets take 2 hours to roast but other than that it’s just a case of getting all the ingredients together in a bowl and mixing it around, before plopping a pile of health onto your plate. Pre-heat your oven to 180C/350F/Gas Mark 4. Wrap your beets individually in tin foil, put them in a baking tray and place the whole lot in the oven. Mine took 2 hours, but check them after one hour to see how they’re getting on. If you can poke a knife through the centre easily, then they’re done. Meanwhile, you can chillax. After about the beets have been in for an hour and a half or so, you can start on the rest of the salad. Put your lentils, chopped celery, thyme sprigs, and 2 garlic cloves (crush them first) into a pan. Pour in 750ml of water and bring to the boil. Simmer for around 25 minutes or until the lentils are soft and yum. Drain the lentils, remove the thyme sprigs and garlic, and leave to cool a bit in a big bowl. Crush/very finely chop your other garlic clove and add it to the lentils. Season with your salt and peppa, add the red wine vinegar and two tablespoons of olive oil, and give it a good aul’ mixing. When your beets are done, get them out of the oven and leave to cool. When they’re ok to handle, peel the skins. They should come away quite easily with the help of a knife. Your hands will go lovely and pinky/purplish too. It helps to chop off the root bits at the top and bottom. 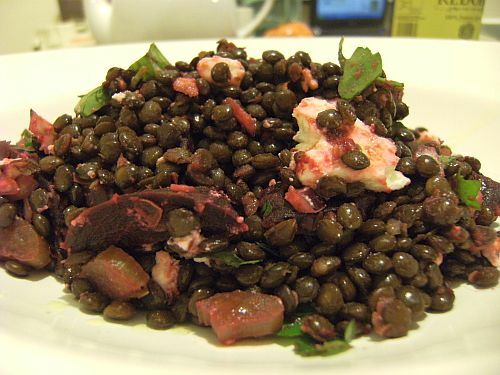 Chop the beetroots into bite-sized chunks and add them into the lentils. I didn’t have a preserved lemon so I just grated about half a lemon zest into the salad. The original recipe says to take the skin from the preserved lemon and slice it finely before adding it to the mix. Whichever type of lemon you use, follow it by adding the chopped onion and parsley, followed by the other 3 tbsp of oil, stirring well. Finally, crumble the Feta cheese into the salad and toss lightly. What you’ll have is an incredibly filling salad that will leave you with a self-righteous feeling of inner cleanliness etc. I’m loving the newest Groove Armada track, which features Bryan Ferry aka the sexiest old cool man ever. Usually, Groove Armada make me think of day-glo-wearing-douchebags-in-Ibiza, but this song is something else. Follow the link to The Hype Machine for a listen. It’s deadly. Beets are my all time favourite vegetable. They are so flamboyant. I really like them with soft cheese, or blitzed into garlickey borsht. Love the photo of Denis Healy’s by the way.